A: Me, wearing my black t-shirt yesterday. Yesterday, we traveled to Ocean City, New Jersey. It’s kind of like Atlantic City if you removed all the alcohol…they’re striving for a “family friendly” environment. We took a walk down the heavily-commercialized boardwalk, and I didn’t realize that we would be traveling half the length of the city, so I didn’t put on sunscreen. I’m now burned pretty heavily on my neck, face, feet, and the back of my right hand. The funny part is that the rest of my body is still a ghostly white because I put on sunscreen once we actually settled down on the beach. The ocean was cold but tolerable. Dad, Joe, and I got to play with three five-to-six-year-old boys on the beach, throwing frisbees, playing baseball, etc. One of them (named Jared) declared to me that I was his best friend. I’m sure that in a couple of days he’ll forget I even existed. Today, we drove over to Washington, D.C. to see the monuments and museums. 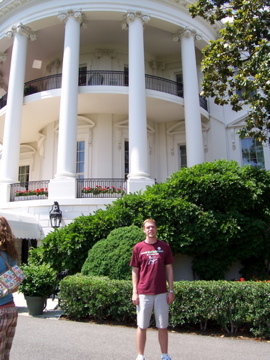 This was the third time I’d been to D.C., so there wasn’t a lot that I hadn’t seen. However, there was one major highlight of our trip — we got to tour the White House grounds! Apparently, they’ll hand out tickets for a self-guided tour about four times a year…and we showed up at the right place at the right time. So I’ve got loads of pictures of the White House and grounds. I’m exhausted at this point. All this heat and sunlight and walking is wearing me out…fortunately, we’re going to an evening service at Rebecca’s church tomorrow, so I get to sleep in tomorrow morning. The only other item on the day’s agenda is her graduation open house, and then we travel home on Monday. Personally, I find that just hanging out around town relaxes me a lot better than vacations, so I’m looking forward to a little rest this coming week. Ocean City is awesome. Delaware is the best state! WOOOT! Wow, Calvin… Can I cut the sarcasm with a knife? So yeah, I’m still recovering myself. You guys totally wore me out. I nearly fell asleep in a work meeting today (yikes). You’ll be cutting nothing but air, sadly. Because Delaware really is the best state IMHO. I lived in its capital, Dover, for a year, and I had a blast.